Search engine optimization (SEO) is the design and modification of web sites to allow search engines to more easily identify and prioritize (rank higher) the display in the search results window. The higher a link appears in a search results list, the larger the number of viewers and the higher the potential number of web visitors. All ranking factors fit into one of two categories. Factors directly affected by a site’s source code are known as on-page factors. Factors independent of the source code (e.g. : inbound links) are known as off-page factors. 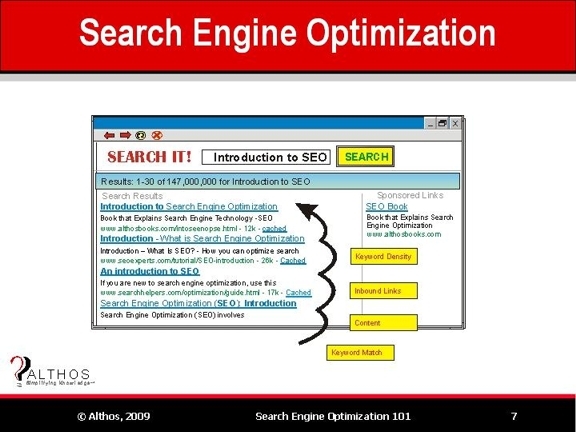 Site optimization is the process that changes web pages, media items, and related elements of a web site so it better it achieves its desired objectives in a certain metric or metrics, such as numbers of visitors (web site traffic), visitor qualification level, or the number of actions that are performed by site visitors (such as orders, subscriptions, or email address submission). Some of the key factors that can influence the ranking of web pages in search engines are the percentage of keywords contained in the web page relative to the rest of the text (keyword density), links from other related web sites, and the content relevance of the website. This figure shows how search engine optimization page ranking can be influenced by various factors. These include the number keywords in the web page relative to the other text (keyword density), number of links from related web sties (inbound links), the type and amount of content on the web page and how well the keywords match the search criteria.